"Anybody can wash a window... it takes a pro to clean it." 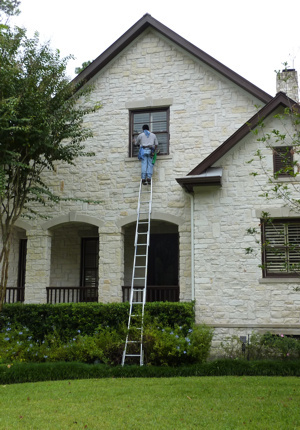 Westchase Window Cleaning Service offers complete Residential and Commercial Window Washing in the greater Houston Area. Since 1978 our family-owned and operated business has provided residential window cleaning and commercial window washing services to Houston and the surrounding areas, including Bellaire, The Heights, Bunker Hill, Katy, Richmond, Rosenberg, Missouri City, Greatwood, First Colony, New Territory, Cinco Ranch and other Harris County and Fort Bend County communities. In addition we also offer new construction cleaning, post construction cleaning and commercial storefront window cleaning. If you are in need of window cleaning service in shopping malls, strip centers or office parks, then contact us. Give us a call or complete our online quote request and let us show you that our window washing and window cleaning service is the best value you can get anywhere! If you do not see your zip code listed above, please contact us to see if you are in our service area. Thank you for your interest in our window cleaning, sometimes referred to as window washing services.